Q1. What components of a track chain wear faster than the other components? Q2. What measuring device is used to measure track pitch? Q3. What is the most common type of track shoe? Q4. What component of the track frame serves as a guiding support for the track chain? Q5. What component of the track frame holds the track in correct alignment with the driving sprocket? Learning Objective: Describe the operation of a winch. Identify the characteristics and maintenance of wire rope. Using a winch and some type of rigging, a vehicle can pull itself or another vehicle through such obstacles as muddy or rough terrain. This is the primary reason for providing winches on military vehicles. In the Naval Construction Force (NCF), an in- depth management program for maintenance and use of all rigging gear is required to ensure all operations are performed safely and professionally. These guidelines are outlined in the COMSECOND/ COMTHIRDNCBINST 11200.11, Use of Wire Rope Slings and Rigging Hardware in the Naval Construction Force and the NAVFAC P-307, Management of Weight Handling Equipment. Most winches that you will encounter are used on tactical vehicles and construction equipment. On tactical equipment, the winch is mounted behind the front bumper and is secured to the front cross member of the frame or between the two side frame rails. In some cases, it may be mounted behind the cab of the vehicle. The typical front-mounted winch is a jaw- clutch worm-gear type (fig. 6-31). The jaw-clutch winch consists of a worm gear that is keyed to a shaft. A bushed drum is mounted on the worm-gear shaft, which is controlled by a hand- operated sliding clutch. The worm shaft is driven by power from the power takeoff through a solid drive shaft and universal joints. The universal joint yoke, connected to the worm shaft of the winch, has a provision for a shear pin that is made of mild steel. This pin has a predetermined breaking strength that allows it to shear when the winch is overloaded. A hand-operated sliding clutch is keyed to the worm-gear shaft outside of the winch drum and must be engaged with the jaws on the side of the winch drum when the winch is to be operated. Disengagement of the sliding clutch permits the drum to turn on the worm-gear shaft. Figure 6-31. 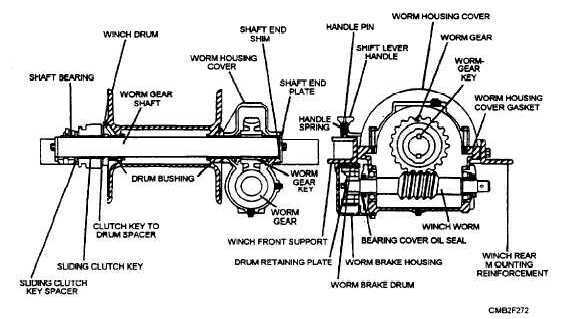 - Jaw-clutch worm-gear winch.